Power via USB 2.0 cable,no other power needed. 1.This product has data line interface and power interface, please properly connected them to USB port of your computer with 2 USB cables we attached in the package,the computer display lower right corner should appear device icon. 1. For smoothly running, please plug both two USB cables when use. 2. For the desktops, please connect the device to the USB port of the motherboard for normal use. 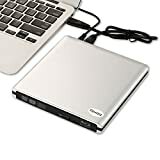 If you connect it to a frontal USB connector,USB hub or extension cords, it maybe cannot recognize by your computer,let alone install the Driver or read the CD/DVD/BD. 3.Desktop users must make sure that your desktop comply with HDCP(Not necessary for laptops). This entry was posted in Computer Desktops and tagged BD/DVD/CD, Bluray, Burner&Player, CIpotZIZ, ComputerPlug, Desktop, Disc, External, MacBook, Notebook, PlaySilver, ULTRA by Express Computer Supplies. Bookmark the permalink.